Greek mythology is everywhere, Egyptian mythology is reliably available as well as Norse and Roman. To get down into the nitty-gritty of Celtic mythology, much of the mainstream does not seem concerned. What is Celtic tends to either have a Christianized touch or read in such a deep Gallic that its hard to understand the keep at it. Many of what is Wicca as we see it is based in the Celtic culture and lore but for someone with a short attention span like me it can be hard to focus on and read and…. ooo look a butter fly. Celtic Myth PodShow, for me, for nothing else, helped me understanding pronunciations. They use music and sound effects to drive the story home the way a radio show would and simplifies some of the readings in a way for everyone to understand without sacrificing any of the content or integrity of the stories. 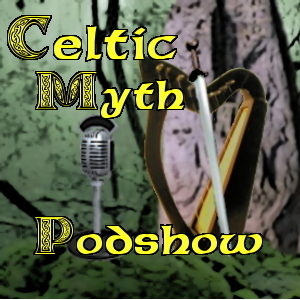 I am not as far in the series as i would like but if nothing else the first 11 of their pod casts are worth the mention.I have not come across many people talking about this little show much on my internet travels but I must say this is one of the best tools I have used for learning about Celtic Mythology. Don’t feel bad lol – short attention span here too! loved “oooh a butterfly!” I’m always doing that lol. When I’ve tried to dig into Celtic Mythology in the past, as with Native American or other cultures, I get “lost in the details”, the pronunciation, the spelling…the trying to remember complicated terms or how one God or Goddess will have multiple stories. Very confusing!